1/2-HP MASTERCARVER® BENCH-TOP BASIC SET – Enjoy all the benefits of rotary power carving! The Mastercarver® flex-shaft machine provides the tools needed to carve better, faster & with less effort! The highest performance rotary flex-shaft set available, it includes everything you need to get started in rotary power carving, without compromise. Specifications: heavy duty, 1/2HP motor (350-watts), 0-30,000rpm maximum speed with sealed ball bearings and reverse (great for grain changes & left handed carving). The specifications of this motor plus dial speed control are optimal for rotary and reciprocating carving . 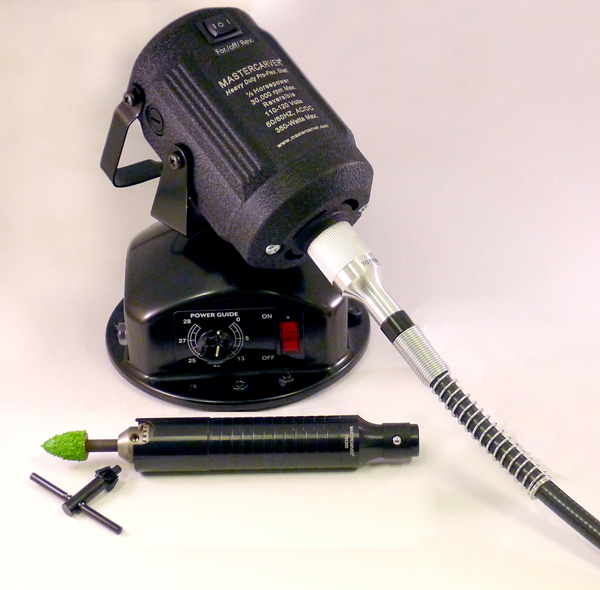 Note: reciprocating carving requires optional 792400 Recipro Carver Pro handpiece. Motor power is transferred through a 38.5″ flex-shaft to power the handpiece. The set includes the patented StealthTM handpiece featuring a key-chuck adjustable from 0-1/4″ to accept accessories with 1/4″ or smaller shanks, without collets! Great for roughing out! Set includes: motor with dial speed control, hanging bail and pivot base (797138 & 797139), 1-handpiece, carbide roughing burr, manual & 2-year motor warranty. Note: 799001 Optional Foot Pedal available seperately.